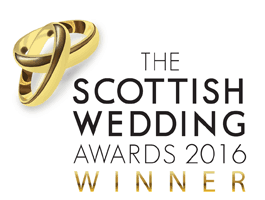 Wedding Cake Prices -Guidelines in Scotland from award-winning wedding cake specialist baker. 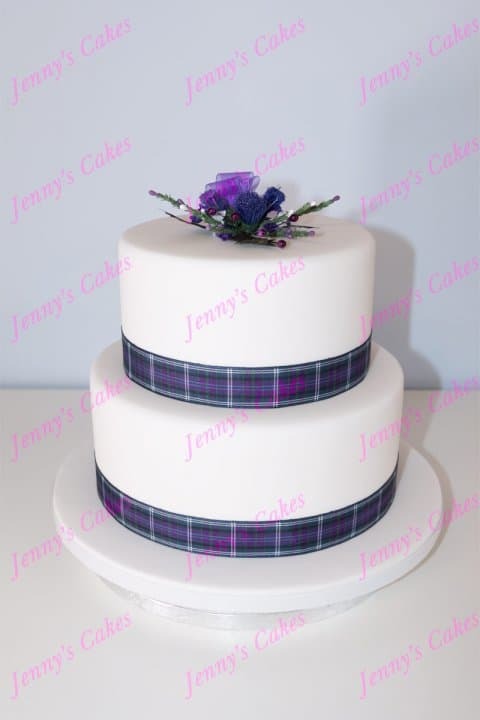 We are happy to provide Wedding Cake Price guidelines for our ranges of wedding cakes. “We knew we had cheaper options elsewhere -however, when we tasted the cake samples, WOW! So, if you want a professional cake that is beautiful and delicious, with dependable service, it’s worth paying a wee bit more than prices from mass-market or ‘hobby’ bakers. With over 30 years experience, we have a better idea that most of how long it takes to make even wedding cakes, simple or complex- we carefully calculate the materials, baking, tools,equipment,decorating and assembly time, and professional delivery and set-up at your venue. 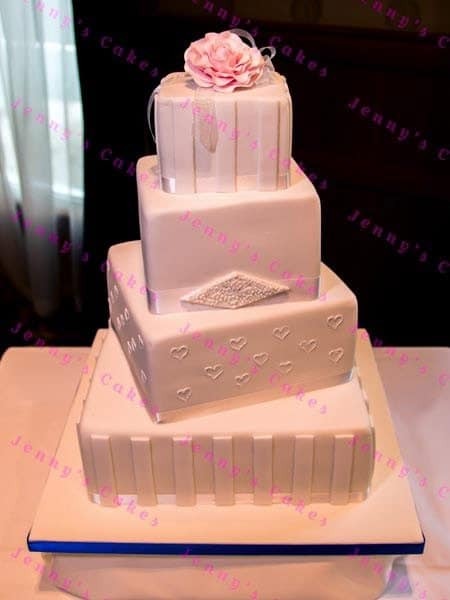 We want you to be confident that you are in safe hands, and that you will be paying a fair price for your wedding cake from Jenny’s Cakes. We do not publish a full price list for wedding cakes, as the range of sizes and decorative elements is almost unlimited. However, we do understand that potential clients would like to have some idea of our range of wedding cake prices, so we have put together the following pricing overview for our cakes. 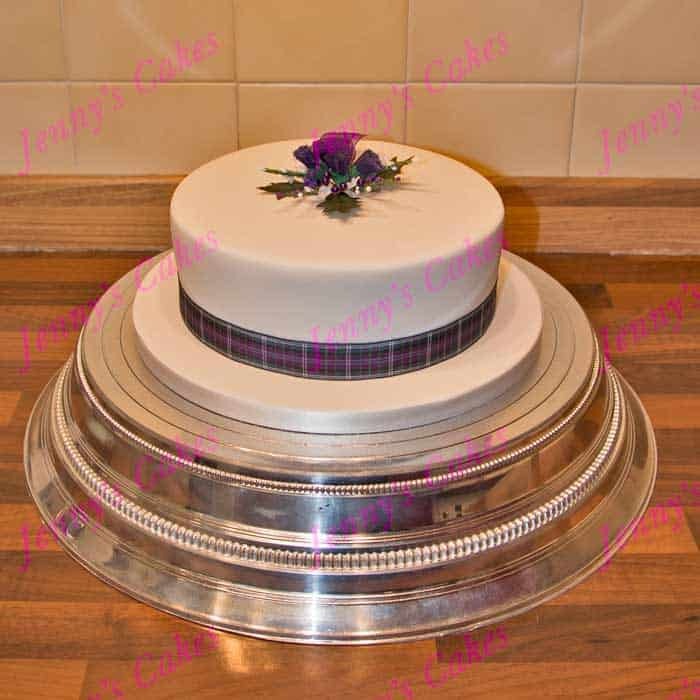 We make a range of smaller single and two-tier cakes, designed for the smaller wedding. 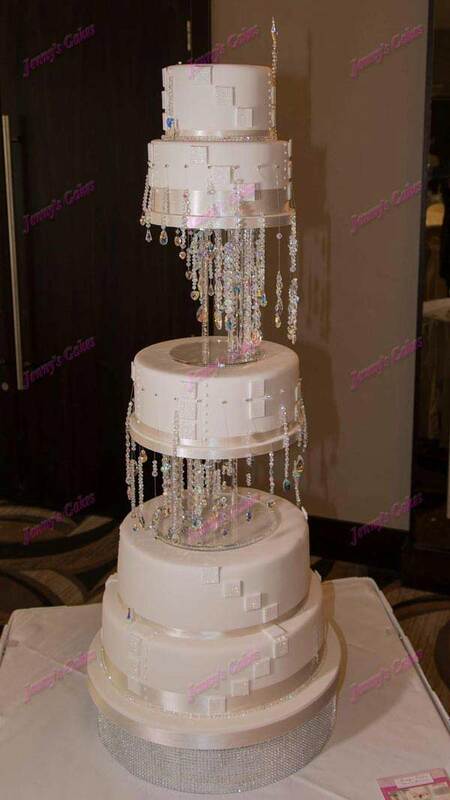 One example of a simple single tier wedding cake shown below. 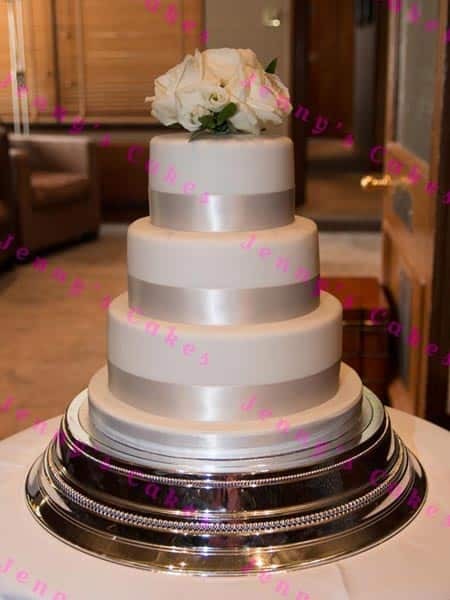 3 Tier Wedding Cakes, for around 70 Guests Pricing Starts below £300. We recently launched our‘Simply Chic’ range of Simple 3 Tier wedding cakes featuring a number of customisable designs and styles, in the range of around £300-£400. Wedding Cake Pricing varies widely, based on the sizes and number of tiers, and the amount and intricacy of any sugar-crafted decorations which are added. The example simple wedding cake below has a fresh floral topper (less expensive than sugar-crafted flowers!) -any fresh flowers are typically provided and added by your florist. Visit our 3 Tier Wedding Cake Shop here for lots of examples of the best wedding cakes for Brides and Grooms on a budget! We make a maximum of five wedding cakes each week,or fewer if a particular design is very complex . Typical pricing for most of our bespoke wedding cakes in three tier cakes is around £400-£600, with Four Tier Wedding Cakes from about £450-£750. 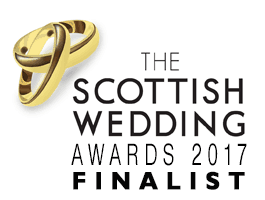 This includes a no-cost Wedding Cake Consultation and Taster session at our Bakery in South Lanarkshire. These are designed and made on an individual basis, and are usually have deeper tiers, and lots more sugar-crafting and decorative elements. Pricing for Designer Wedding Cakes can easily be well over £1,000 for a large wedding party. We are always happy to provide budgetary pricing for clients, if you are able to fill in our short weding cake enquiry form, you can email example photos for budget pricing, or discuss your ideas in detail during a ‘Tea and Tasters’ consultation. We typically create a maximum of FIVE wedding cakes each week, sometimes just three or four cakes most weeks, due to the complexity of wedding designs and the time each cake takes to make. There are lots of stages involved in making a cake to a professional level, and we prefer to concentrate on fewer cakes and achieve the highest levels of quality and customer service. In the summer months we advise booking at least a year ahead of your wedding date. The first step is to check our availability for your wedding date, using our wedding cake availability form– we can then look at any cake photos/ideas you may have, advise on budget pricing, and book your personal wedding cake consultation to discuss your ideas on more detail. Further info on our Tea and Tasters consultations and client’s video on our Reviews Page. Due to high demand for wedding cakes, we regret that we are unable to offer celebration/birthday/christening cakes- sorry!